It has become a sort of a ritual. I lay in bed, tossing and turning but no sign of sleep. Oh good! Tomorrow I ride on the hill roads while having to fight sleep from taking over. Couldn’t be more excited! To be honest, I wasn’t trying too hard to fall asleep either. Passed time watching a mundane IPL game and the very entertaining Craig Ferguson, while waiting for the clock to strike the witching hour. Just when I was checking my luggage for one last time before saddling up, came the rain. This ride would be different, I knew. 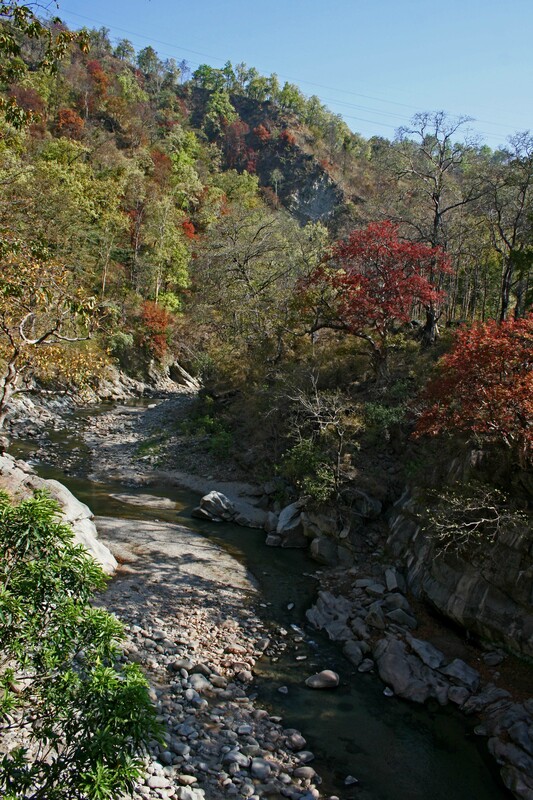 I had broken my wonderful Nikon D80 on a earlier ride to Sariska National Park and on this ride, I would have to make do with a friends Canon 450D. It is a very different camera from my Nikon. For one, the controls and the metering are completely different and it takes a long time to get used to. Also Dope has been worked upon. I have removed the stock air filter and replaced it with a K & N air intake. The carburetor has also been up-jetted. As a result both the acceleration off the block as well as the top speed has increased substantially. This will be fun. Anyway, it happened to be a passing rain and it stopped within fifteen minutes and I was good to go! The idea was to take the Meerut by-pass and turn into Khatauli and proceed from there towards Pauri via Bijnor and Najibabad. 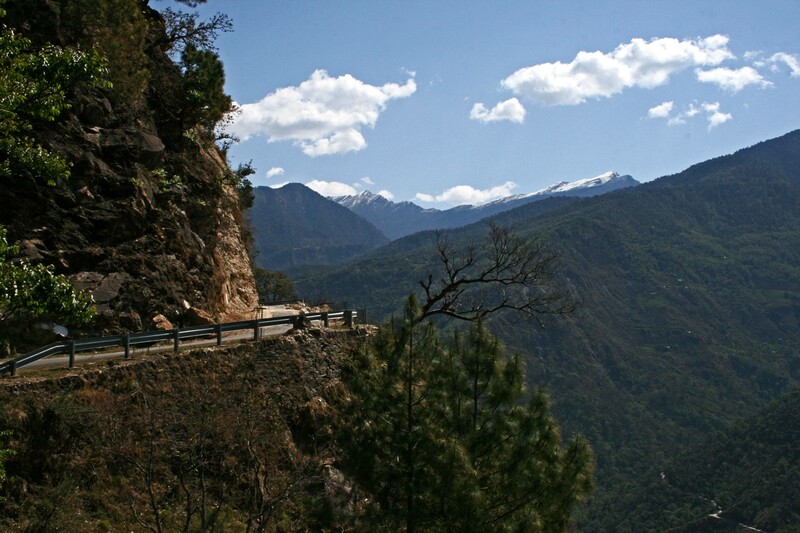 From Pauri, the route joins the National Highway 58. 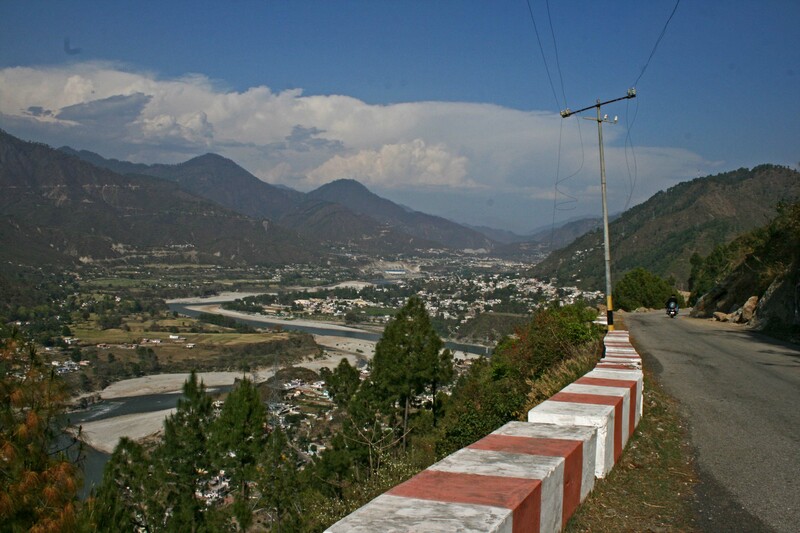 I would follow 58 till Rudraprayag from where I would cross the Mandakini and take the left bank road to Ukhimath. 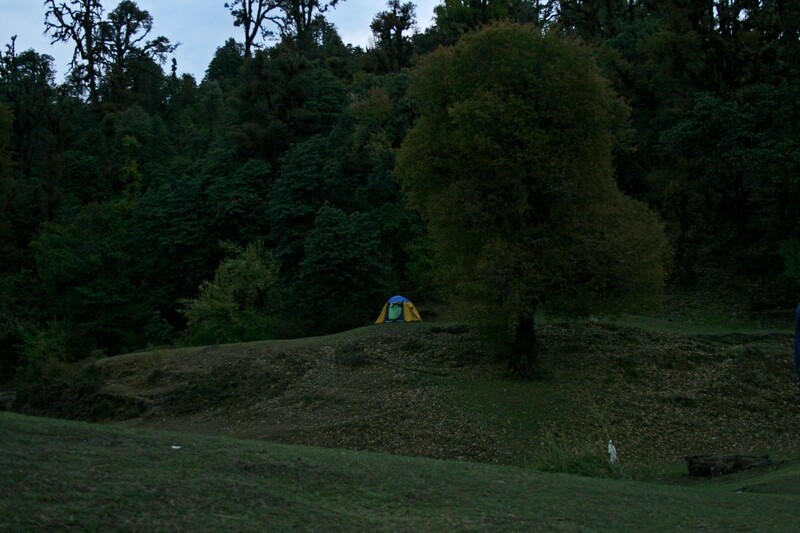 My plan was to reach Saari, (trailhead to Deoriya Taal) till nightfall. The plan was ambitious but like Gandhi once said: ‘aim for the sky and you reach the treetop. Aim for the treetop and you never take off’. Flawed plans and questionable quotes aside, I was ready for the ride. By the time I left, it was almost 3:30. The idea was to get past Meerut before sunrise, which was done easily even after a 20 minute wait in a cattle-shed waiting for a passing shower to …well, pass by. A few kms after the Meerut by-pass I took the right turn into a sleepy Khatauli just as the sun was coming up on the wheat fields. 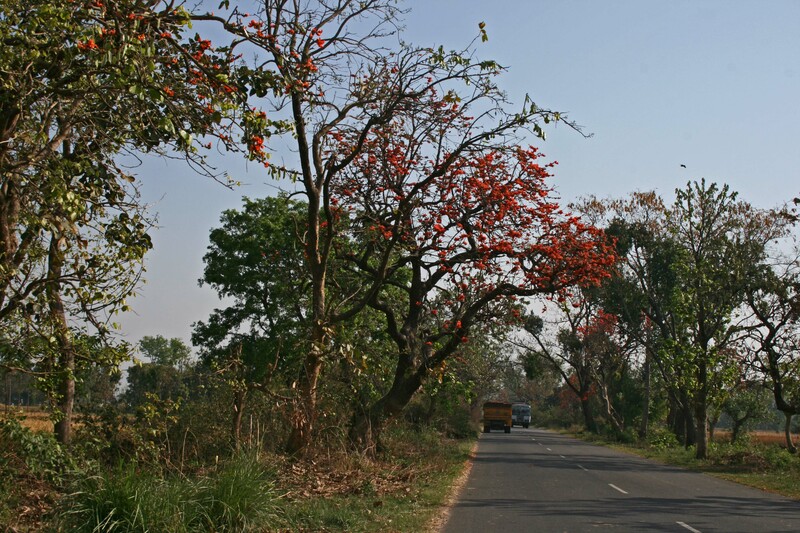 From Khatauli, I followed the Jansath Road and turned left towards Bijnor. On this stretch, as I stopped for a snap, I realized that my bike was leaking engine oil. When I had removed the stock air filter, I did not remove the box it was enclosed in. One of the pipes leads from the main crank into a breather under the seat. From there, another (drainage) pipe leads to the empty box and it was this that was spewing oil all over the silencer and the rear wheel. By my estimate I had lost around 300 ml of oil by the time i spotted the leak. So I disconnected the pipe, stuffed it lightly with some cloth and started riding again at a much reduced speed. A constant monitoring for the next 50 kms or so revealed that there was no further leakage. I always carry a liter of oil on me when I am touring, so the loss of oil was not a concern. But the leakage coated the hot silencer with grime and ruined Dope’s painstakingly achieved shine. Too bad for photographs! The hills appeared soon after Exxon Valdez was fixed. There was a bottleneck at Najibabad, but then if you had a totally hassle free ride in the plains; it would be really weird, no? The roads were in good state as monsoon was still months away. I love this road. I have taken this twice in the past and on both occasions I was heading to Lansdowne. 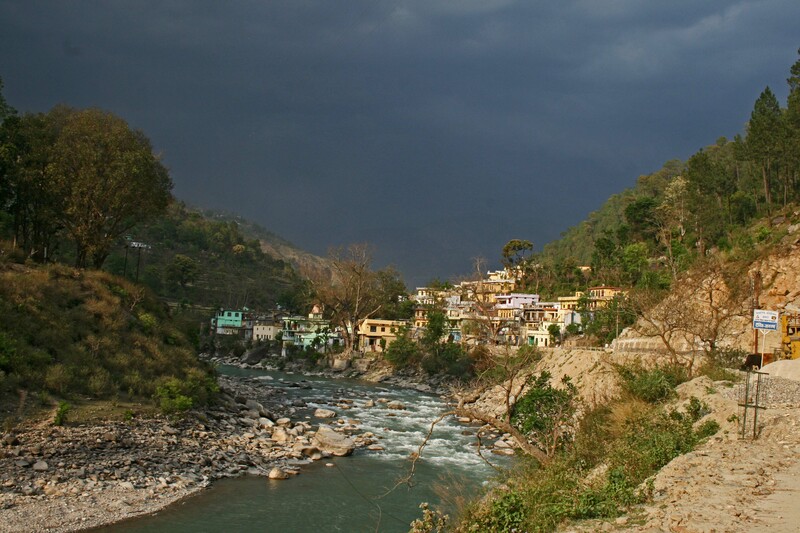 This time I would pass by this lovely town and head on further towards Pauri. 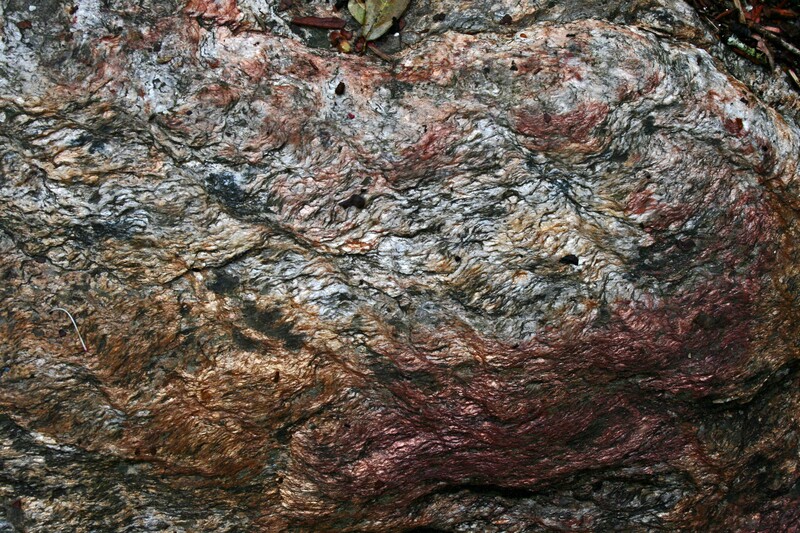 It was late spring and the colours of the season were reflected in the foliage. Once you cross the Lansdowne turn, the road becomes exceptionally empty. It is a good idea to stop your vehicle on a lonely stretch and stand there listening to the silence. 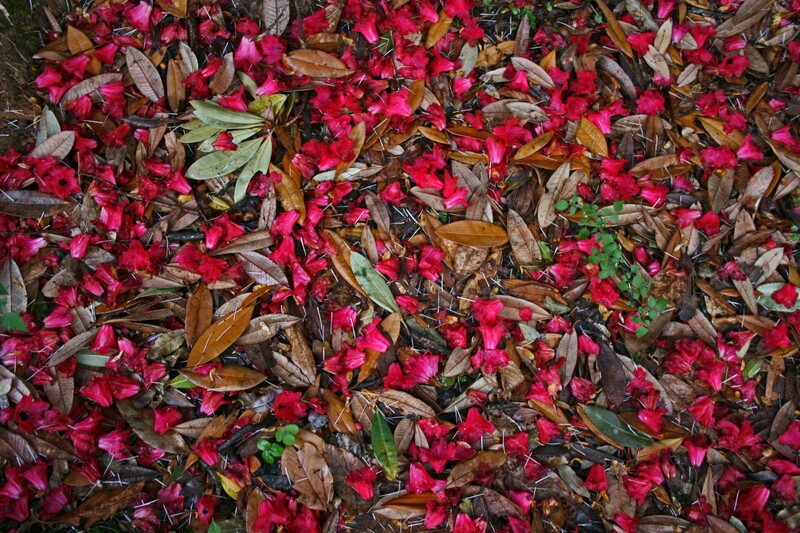 The only sounds punctuation this deep silence are the occasional chirping of birds and the constant, mild crash of a dead leaf falling on a bed of other dead leaves. At one of the turns after Lansdowne. You can notice the results of the oil leak on the silencer. 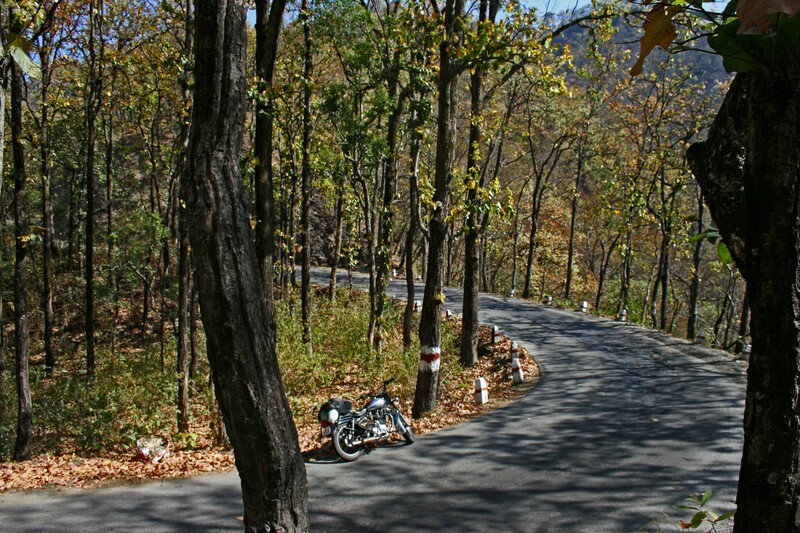 A lovely bend on the road and your bike to lean on…BLISS! I had a quick lunch at a road-side restaurant and I used to time to consult the map. For those riding out there, it’s a good idea to avoid the TTK maps. Not only are they ambiguous and contain the very basic information, but also also hugely misleading. 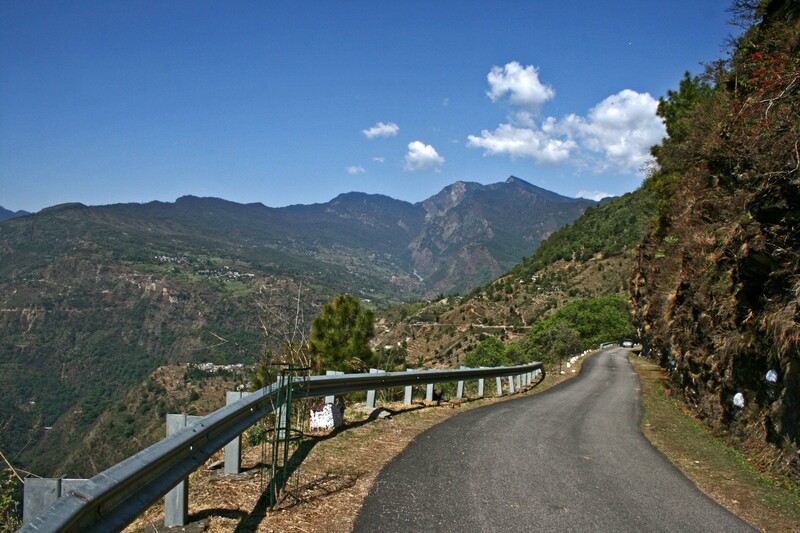 A section of the road between Pauri and Lansdowne, which has been closed for years, has been marked as a state highway. 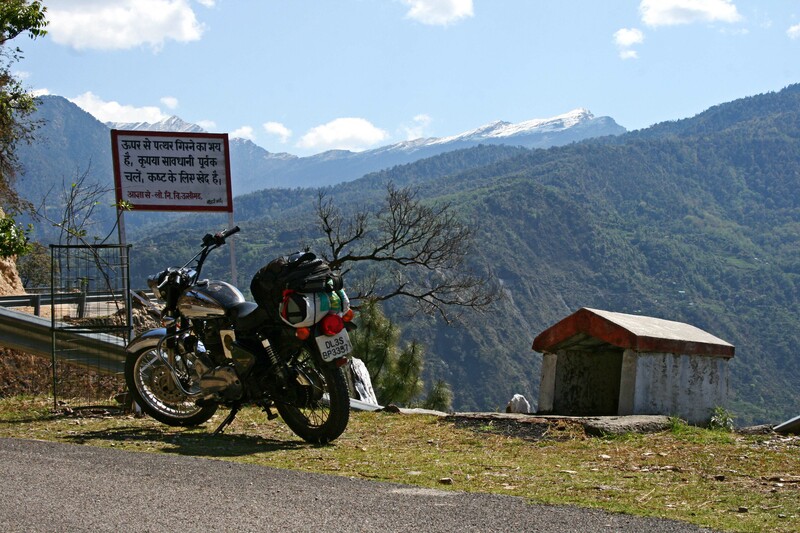 Your best bet for Uttaranchal is Nest and Wings. If N & W is unavailable, use Eicher maps (also happens to be my past employers). 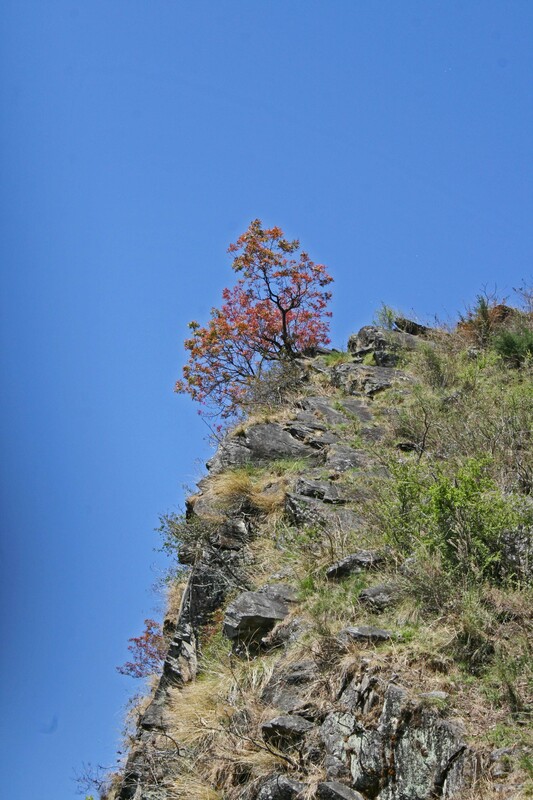 Map errors notwithstanding, the roads between Lansdowne and Pauri were beautiful, broken in patches and wild. 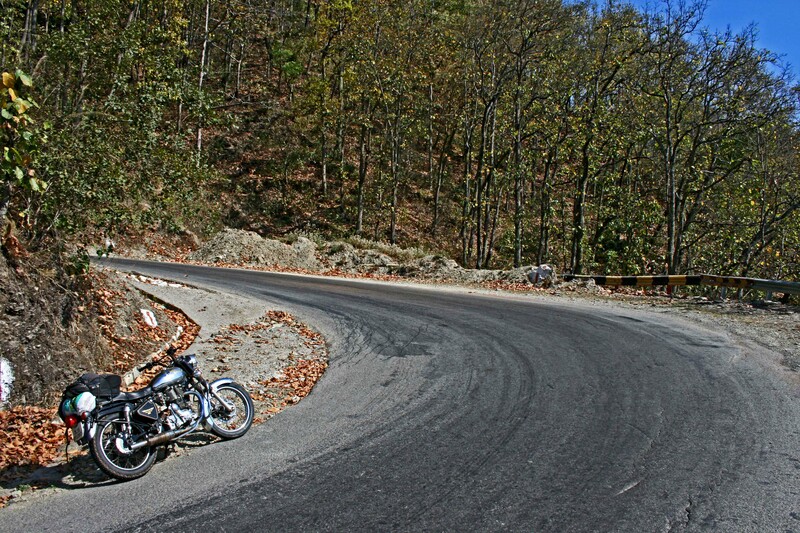 After Lansdowne, it was downhill all the way till Satpuliafter which the road starts rising again. Ironic as it may sound, I am somewhat scared of heights. It’s all good when the roads are wide, but when the roads are narrow (like on this stretch) and you can see (or not) the end of the gorge, my heart starts racing. It’s a pity that photographs can never tell you how scary the roads have been, because on the rougher stretches you are shitting bricks and hoping that you do not veer even two inches to the right. Taking a photograph is the last thing on your mind. 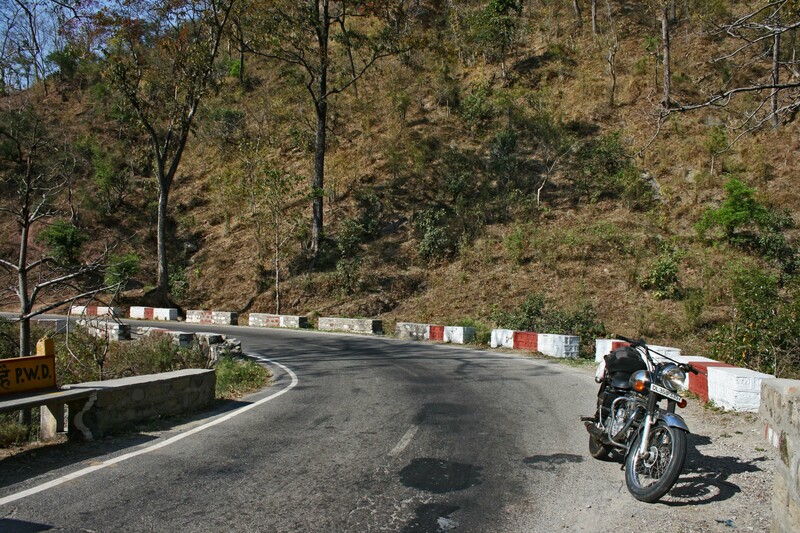 After a couple of hours of white-knuckle riding, I found myself on the outskirts of Pauri. A quick glance at the watch confirmed that despite the time lost to the oil leak, I was well on schedule. 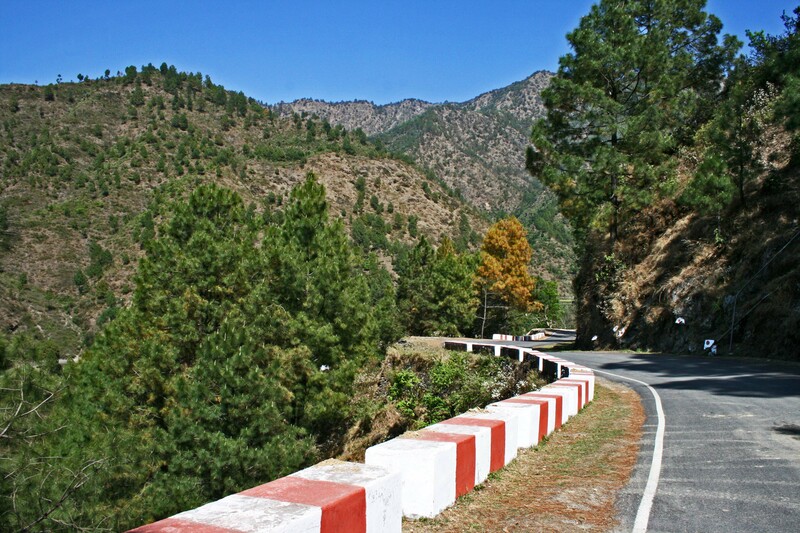 The road started to descend immediately after Pauri and in around 30 kms, it connected with the National Highway 58 at Srinagar. After riding on the single lane, a drop-and-you-are-dead road for the last 3-4 hours, the 58 was a welcome break. It was near perfect tarmac and it was WIDE! I could finally test the mods on Dope and boy, was I happy! The bike was pulling like a runaway freight-train and thanks to the roads I could take them corners at almost triple digit speeds and engage in some foot-peg scraping foreplay. 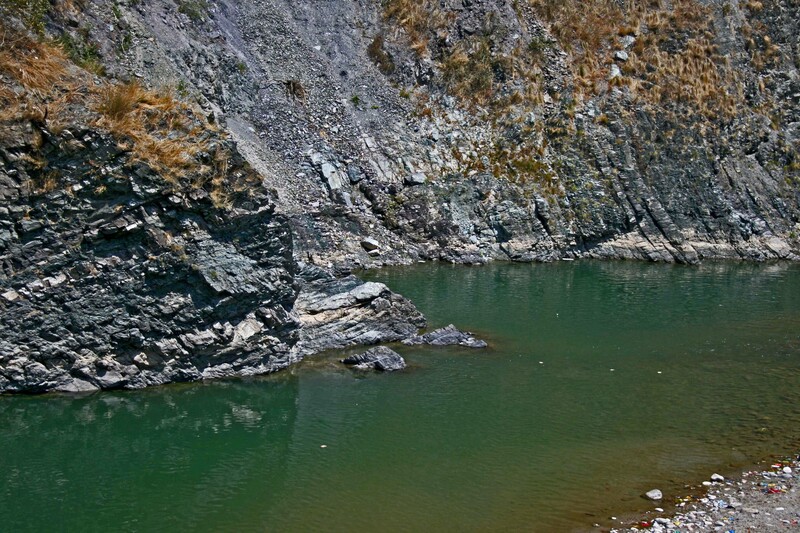 But like all good things, all this fun soon came to an end as I reached Rudraprayag. 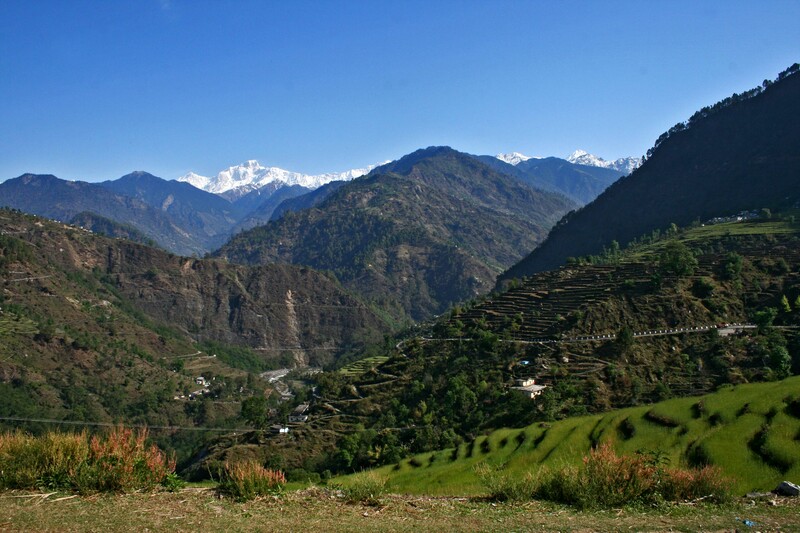 In a previous post on Binsar, I talked about how much of my fascination to Uttarakhand was borne out of the works of the legendary Jim Corbett. 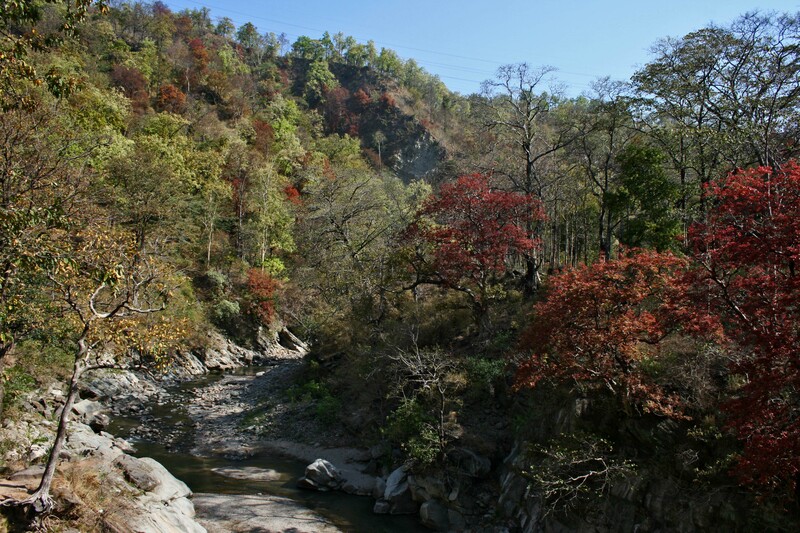 No place is more memorable to Corbett fans than Rudraprayag, the once hunting ground of the eponymous man-eating leopard. Between 1918 and 1925, the beast killed at least 125 people in the area, most of them pilgrims on their way to Kedarnath or Badrinath. A plaque still stands at the spot where Corbett shot the leopard. 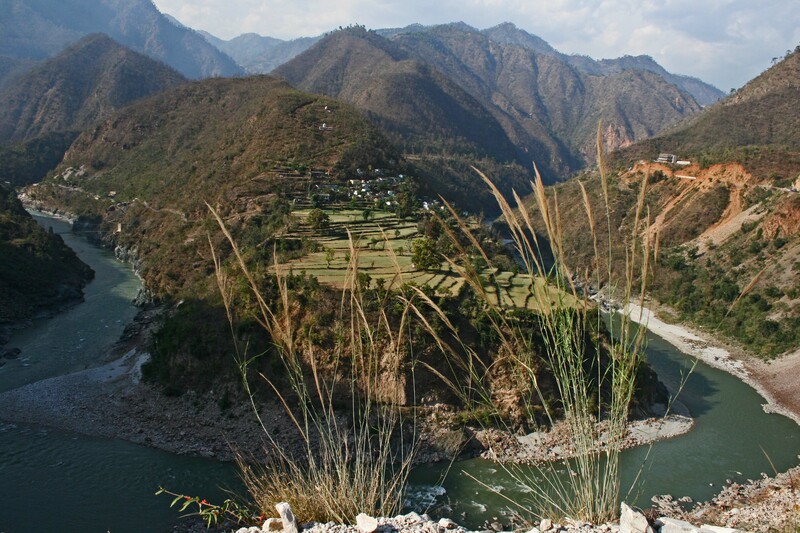 The Rudraprayag of today is a far cry from what it would have been back in the days of Corbett. 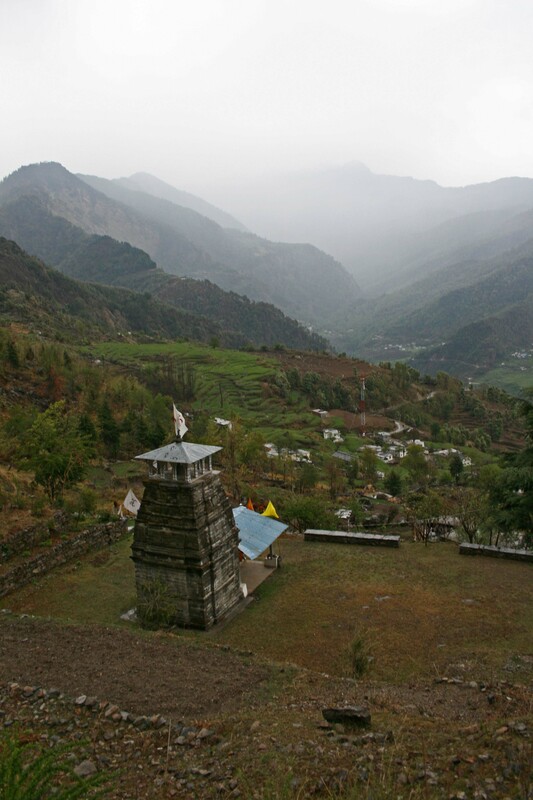 It is a pile of concrete, replete with hotels which are full of transiting pilgrims during the yatra season. 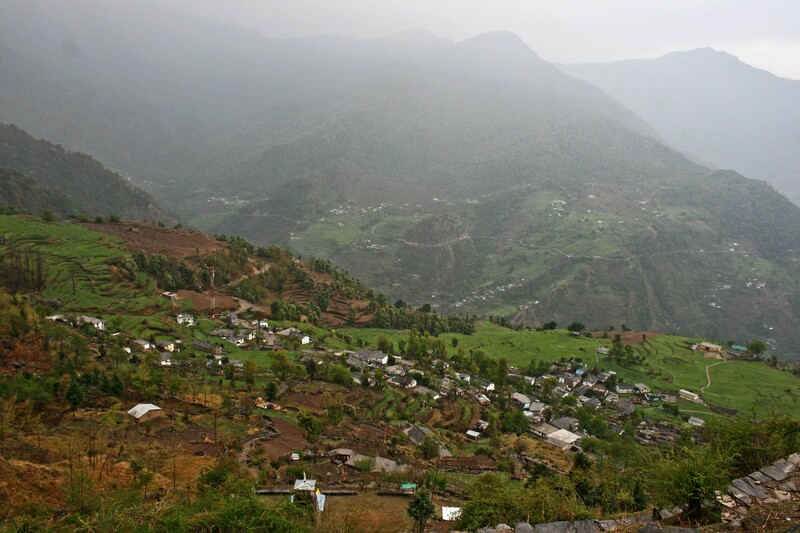 I stopped at the main square for a quick chai and resumed my journey across the Mandakini on the road towards Ukhimath. It was around 4:30 pm and chances of reaching Saari looked pretty good. Truth be told, I was rather tired at this point and the lack of sleep did not help either. Then things went from bad to worse. 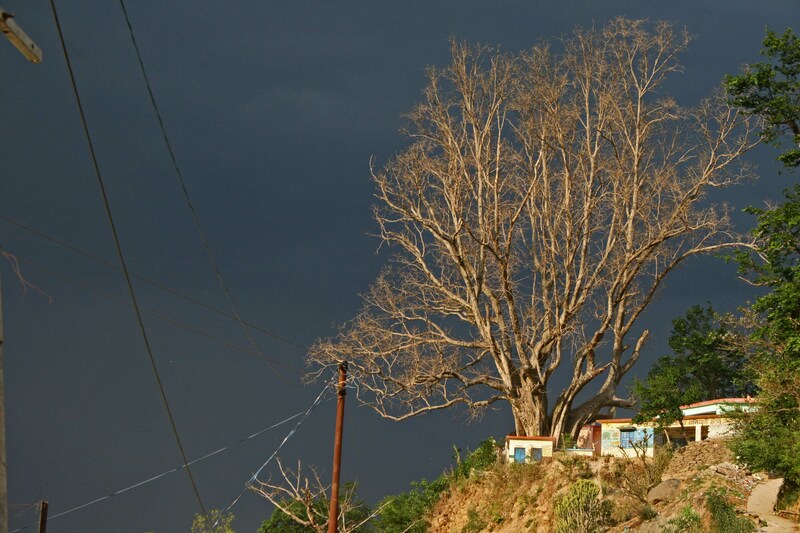 Just as I was about to enter Agastyamyni (19 kms from Rudraprayag), the blue back-drop of the spring sky was replaced by a threatening, dark grey cloud. The wind was picking up and the dust in the air made it almost impossible to ride beyond 10 kmph. But I labored on. Soon big fat drops began to fall from the sky – an ominous sign of things to come. Amazingly, the GMVN bungalow of Chandrapuri magically appeared at the very place where it started pouring. I put dope in the parking and secured a room for a princely sum of Rs 360. It was a spotlessly clean double room with a TV, geyser and enough space to play football! Approaching Agastyamuni. The sky darkens! There was no electricity and I decided to sit by the window and write my journal while waiting for the generator to be switched on at 6. The rain had, by now, transformed itself into a howling storm. Upon enquiry, the hotel staff told me that it had been surprisingly hot the last few days and when that happens, Mother Nature sends a storm like this to cool things down. On the brighter side, I could now expect a sparkling morning. Yay! Meanwhile, the morning after, I look out of my window and see this! It was too much waiting for the lights to come on so that I could take a hot water bath. But I was super sleepy too. So I showered with ice-cold water to wash off the day’s dust and grime and dived under a pile of warm blankets. Sleep needed no further invitation. I have only the minutest recollection of being woken up (the dining room was upstairs) when the dinner was served. I was woken up early in the morning by Anindita who had a little adventure of her own on a double-decker bus on the way to Shirdi from Mumbai. After making fun of her for a while, I got dressed and stepped out into a dazzling morning. 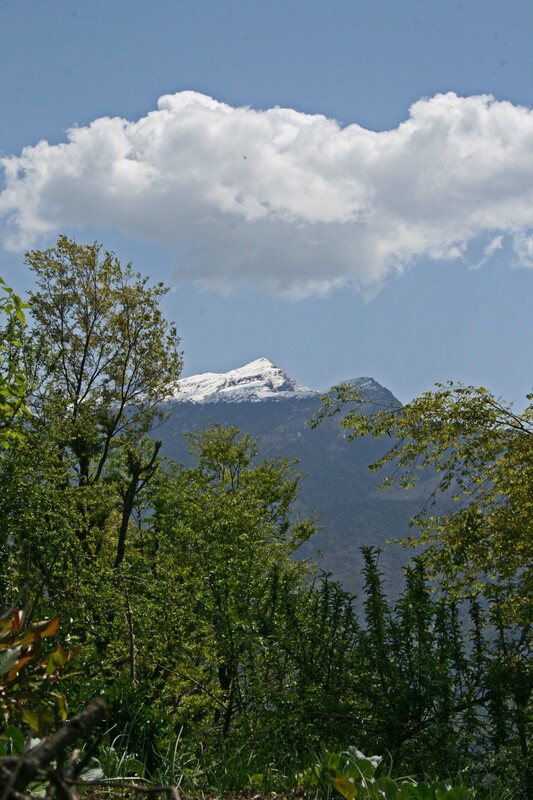 The clouds had disappeared and in its place stood a huge, snowy massif on one side of which was the mighty Chaukhambha and on the other, Mount Sumeru. So this is what I came to see! 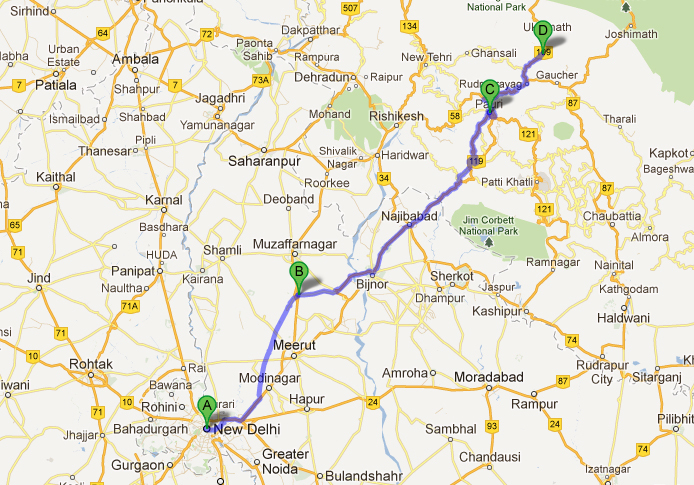 Recharged, I wolfed down some breakfast, cleared my dues, strapped on the luggage and hit the road to Ukhimath. 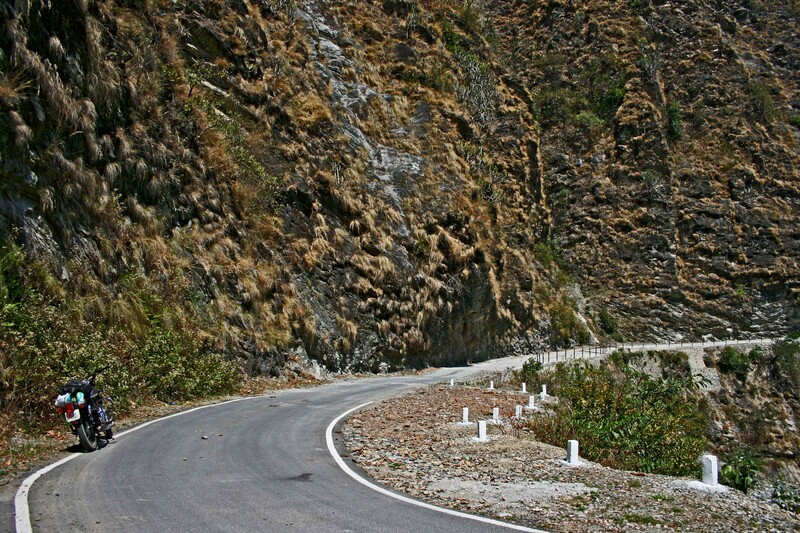 Around 20 kms from Chandrapuri, the road bifurcates at Kund. The one on the left leads to Gaurikund (trailhead for Kedarnath) via Guptkashi while the one on the right, which I took, leads to Ukhimath. 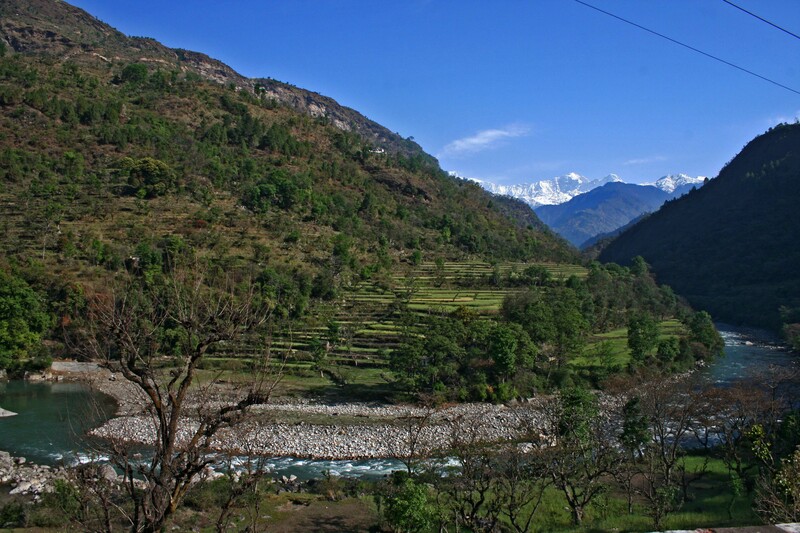 Till Kind, the road followed the course of the Mandakini and then it starts climbing towards Ukhimath. Thanks to yesterday’s shower, the air was clean and the landscape looked brand new. 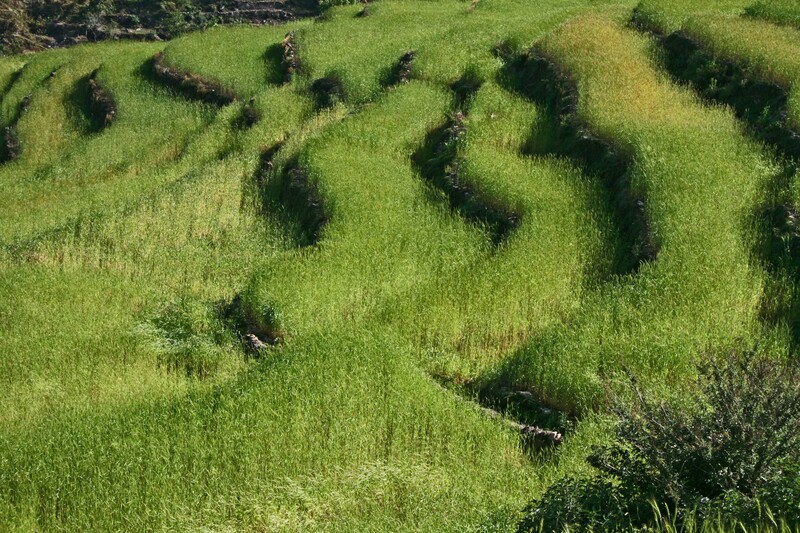 The serpentine road passed through little villages surrounded by terraced paddy fields. It was early but life in these villages was already buzzing. 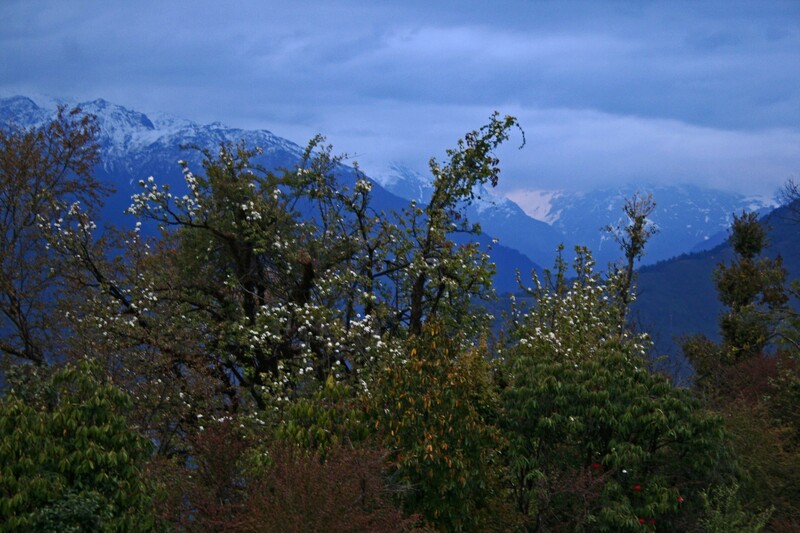 The kids were on the way to their school; the adults were either working their fields or manning their businesses, all the time being watched over by the mighty Himalayas. 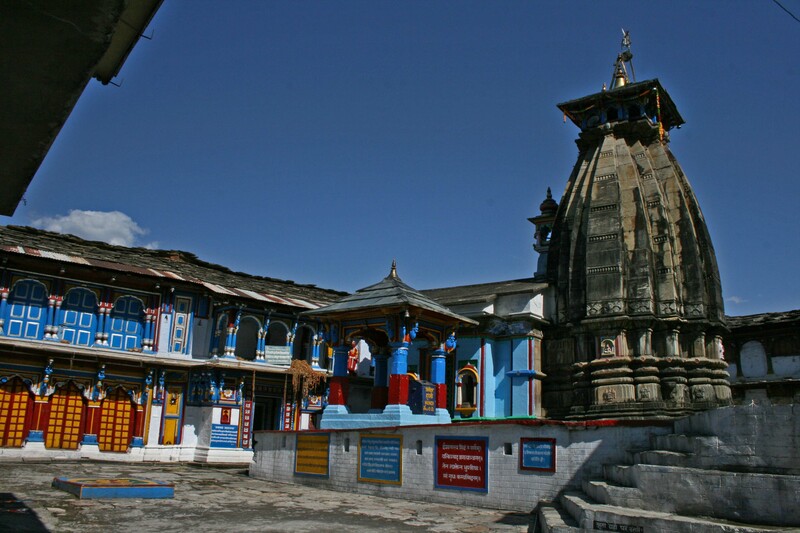 Okhimath, as it is also spelled, is a lovely little town, known for the ancient Omkareshwar Temple. 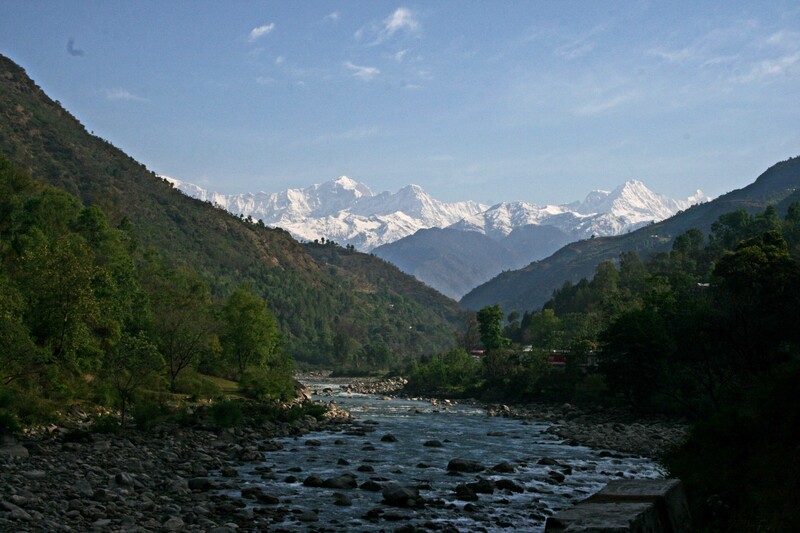 During the winter months it is home to two of the five kedars – Kedarnath and Madmaheshwar. Luckily the two deities were still at the temple when I visited and I was lucky to have a darshan. This brings me to the rather ambiguous issue of Religion. I am not a religious man in my day-to-day life, but when I am travelling it is a different story. I have often put it down to the dangers of the road. It is tough riding in India and you tend to fall back on the crutch that is religion. Often, while riding you come across a tiny roadside temple, like the millions of others that dot the Indian roads. If you would have passed by it in Delhi, you would hardly glance. But on the road it’s different. Almost instinctively your right hand first touches your forehead and then your chest and you lips quiver in a prayer or two. Then there is nature! 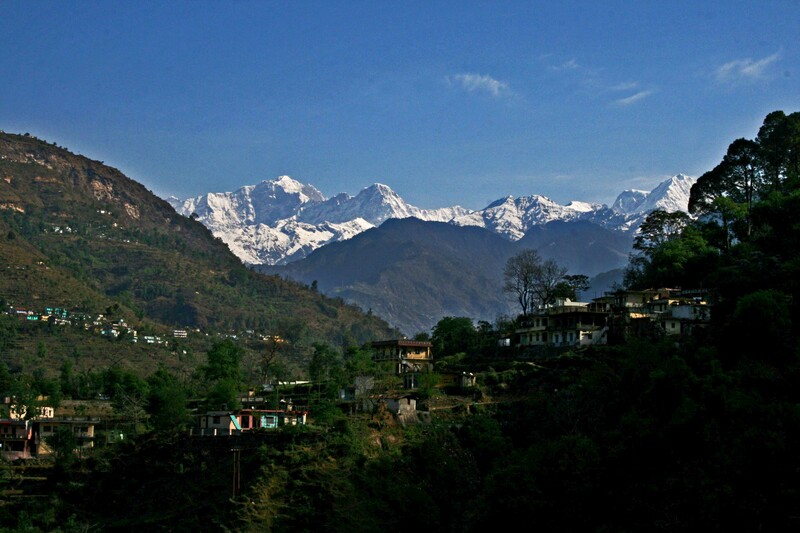 Lift a temple off the crowded streets and put it on a hill against the backdrop of the high Himalayas and it immediately commands respect. 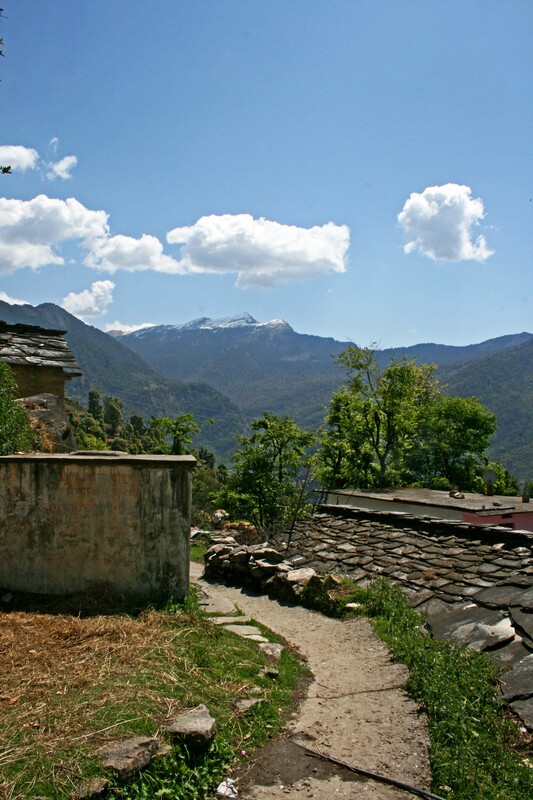 The Panch Kedars (Kedarnath, Tungnath Badrinath, Rudranath and Madmaheshwar), in this case, have been around for ages. People have walked up to them from the sweltering plains below for thousands of years. The architecture of the temples themselves reflects that very antiquity. So the combined effect of the mythology, the architecture and the picturesque setting results in a very religious yours truly. 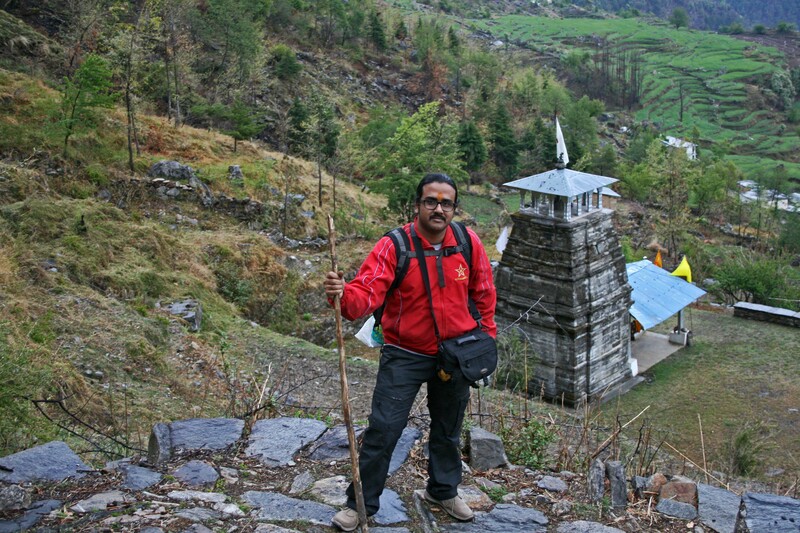 Saari village, where I intended to reach yesterday is merely 12 kms from Ukhimath. I was actually glad that I did not make it to Saari last evening. Considering the overcast conditions and the hurry I would have been in, I would have missed out on the sights that I so enjoyed this morning. I was in no hurry at all. 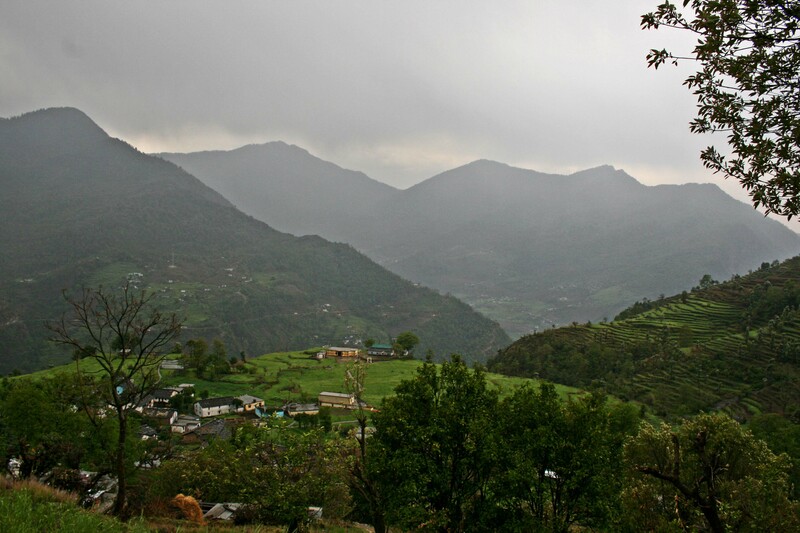 While I was researching for this trip on Indiamike.com, I came across Prashant, who like me, was planning to travel in the area. So we decided to meet up in Saari and then trek up to Deoriya Tal together. When I called him from Ukhimath, he was still 3-4 hours away. I could and did take my own sweet time. 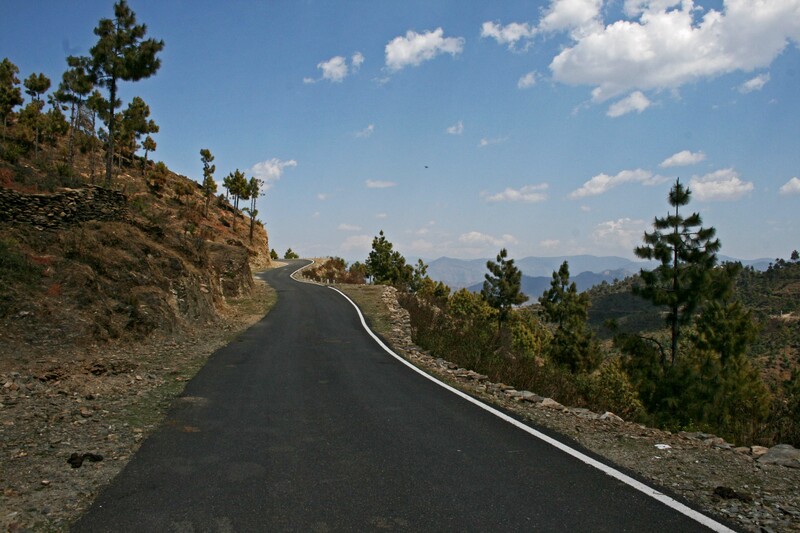 The roads were amazing as usual and as after Ukhimath, villages are few and far between, the traffic too was sparse. So I stopped every 500 m or so, killed the engine and listened to the mountain sounds. 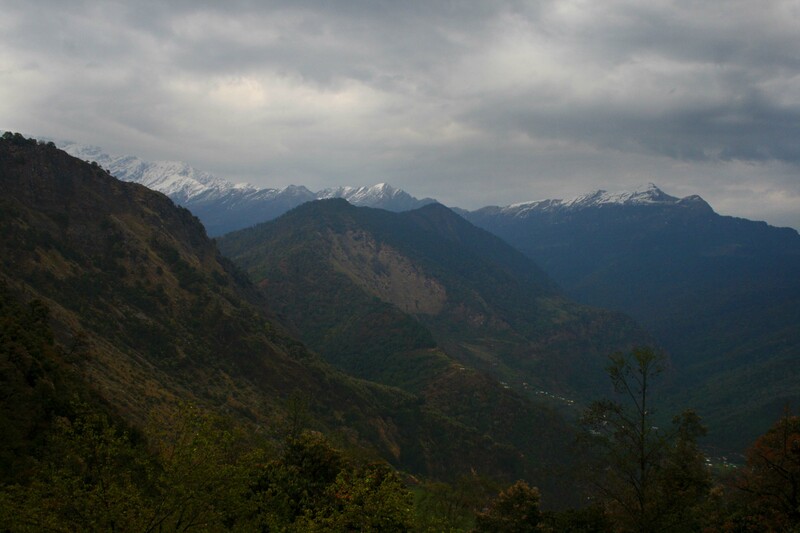 By now Chandrashila (4000 m, which I plan to climb in course of this journey) with the sprinkling of snow near the top was visible. 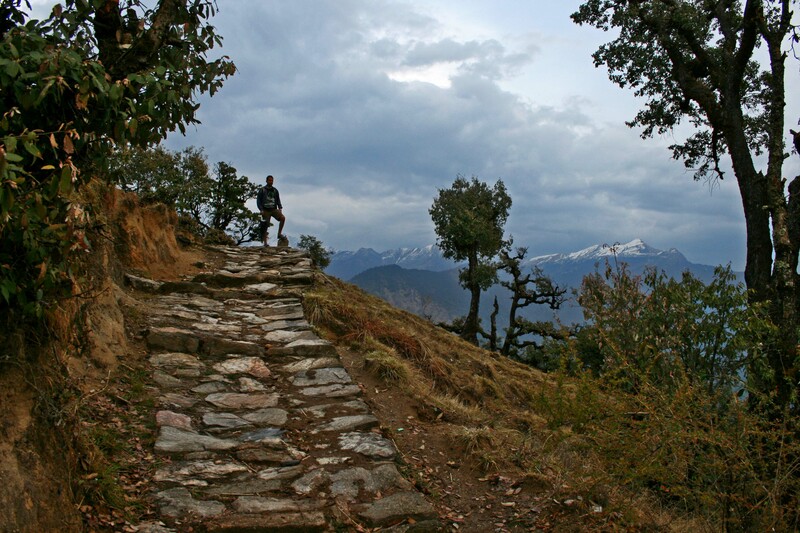 After around 10 kms, a road branches off left and leads to Sari (2-3 kms). 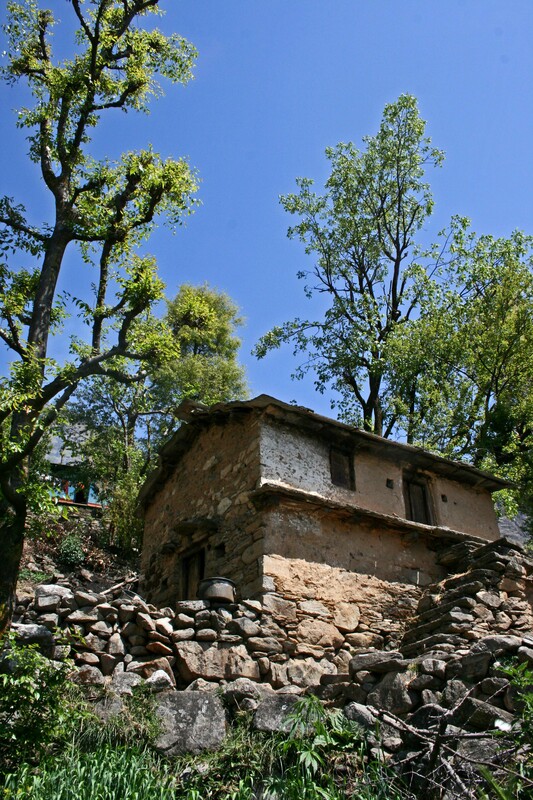 Most of the people in Sari are involved in tourism. 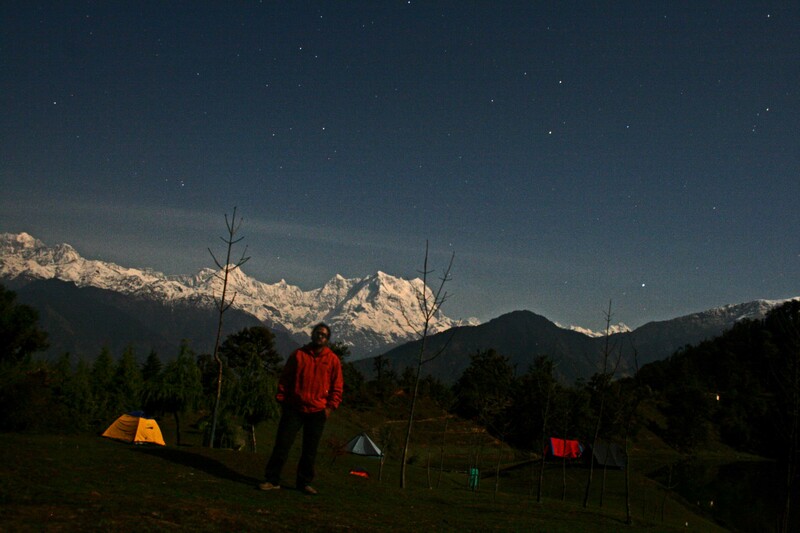 One of them, Mr Raghuveer Negi (Ph: 09690090515) was to be my host. 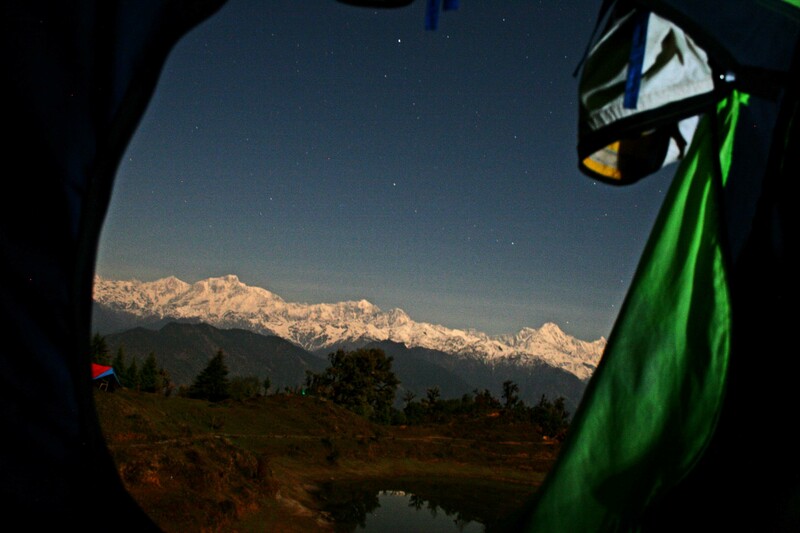 I had contacted him from Delhi and he was to rent us camping equipment and guide us to Chopta, should we plan to trek there from Deoriya Tal. 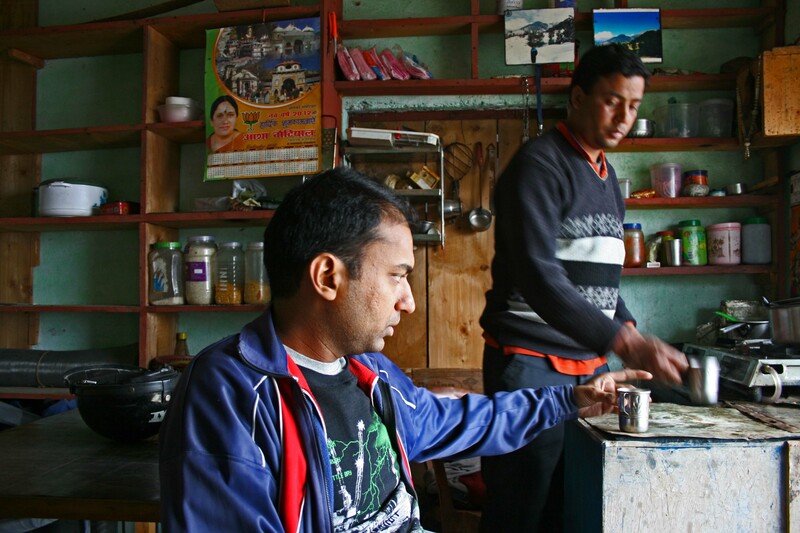 I reached Negi’s shop in the village and on finding out that Prashant was still 1.5 hours away, went off on a walk in the village. The oldest part of the village can be reached by one of the many tiny paths that branch off the main road. 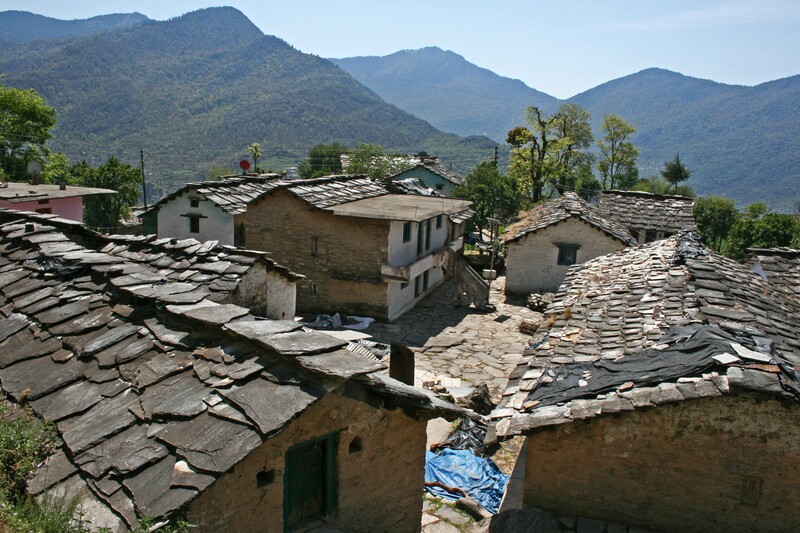 There is a square of sorts, paved with stones, around which stand a handful of typically Garhwali houses. 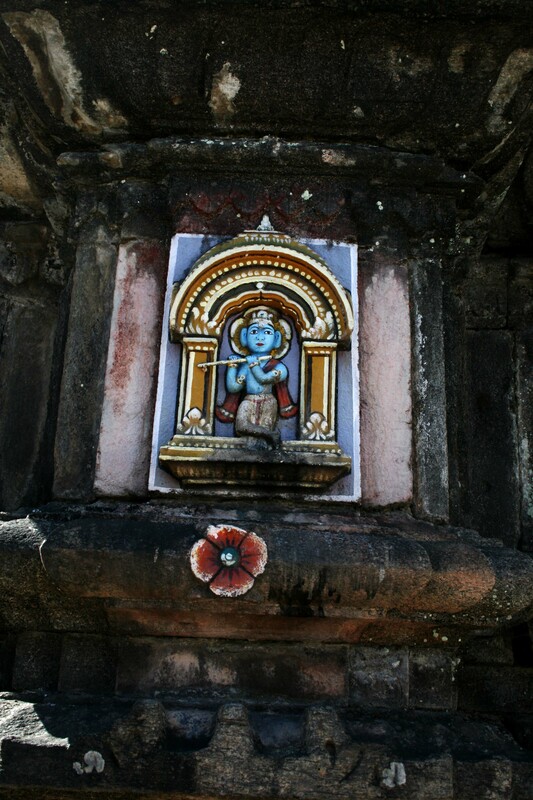 They are visibly more than a century old and the door jambs have ornate sculptures and a Ganesh on the lintel. Beyond the old village is a path through the rice paddies which takes you to the school, located on the end of a sheer cliff! At this time, I got a call from Prashant who was stranded on the Ukhimath Road as public transport from there was limited. So I drove down, picked him up and came back to Negi’s tea shop for a spot of lunch. Prashant and I hit off immediately and very soon Negi too joined in on the banter. While we were having lunch the sky darkened and it started drizzling. Clouds meant that when we do get to the lake, we would not be able to enjoy the views the lake is so famous for. On the brighter side however, it was a full moon night and when the clouds do clear it would be as bright as a slightly dull day. So lots to look forward to! 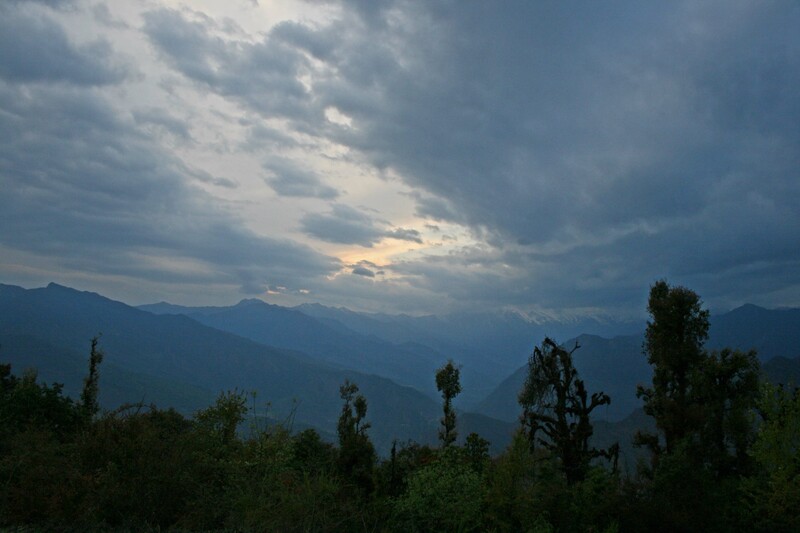 In an hour or so the rains started to hold and we started on the 3 km uphill trek to Deoriya Tal. 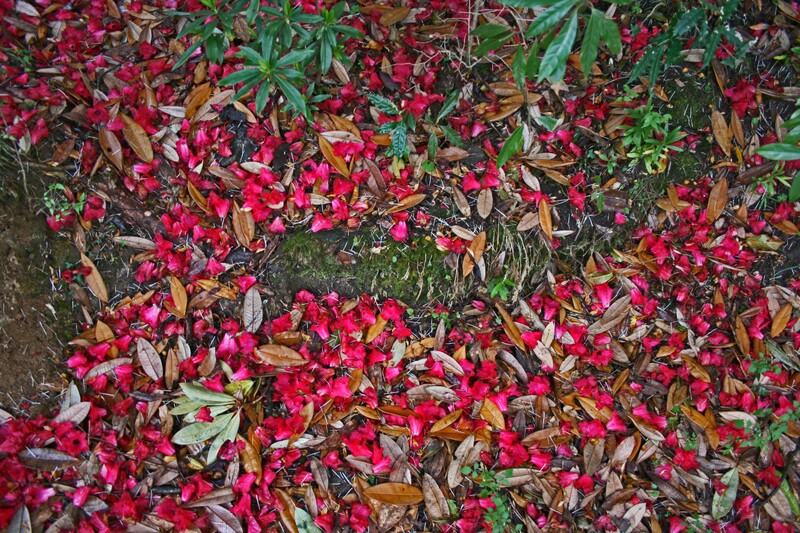 The path is very well-marked and more often than not, paved. On a clear day even the most unfit hiker (read: me) can cover the distance in around one hour. We however had to stop on several occasions due to rains and by the time we reached the top, we had taken more than an hour and a half. Even when you reach the top, you don’t see the lake right away. 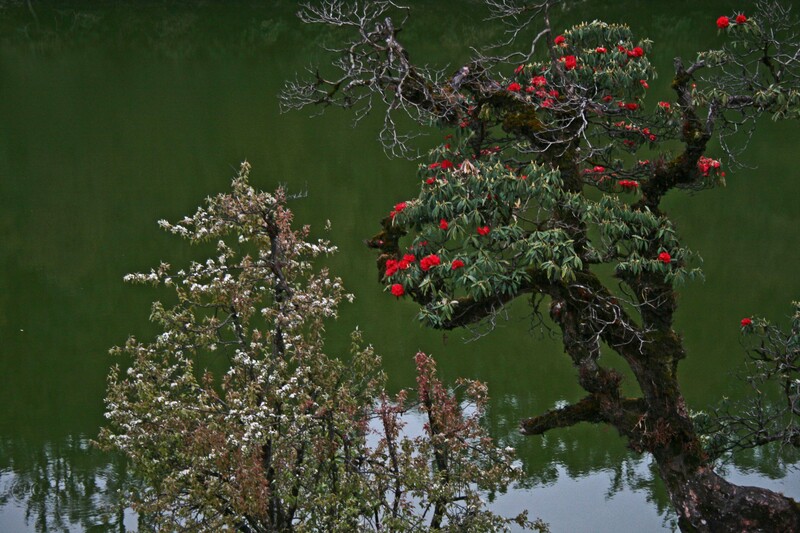 But once you are clear of the thicket, the lake unfolds and proceeds to take your breath away. Like I said, it was cloudy and the peaks were hidden but still the setting makes you stop dead on your tracks. Errrr… speak softly and carry a big stick, i guess! The sun was just about to go down when we reached the banks of the lake. So without further ado, we decided to walk around the lake before it gets dark completely. At this moment let me tell you, the lake is much, much larger than it looks. A paved pathway runs along the banks of the lake and in the falling evening light, it had the air of mystery about it, especially the bit that goes through the woods. Slightly shaken, but love this pic! 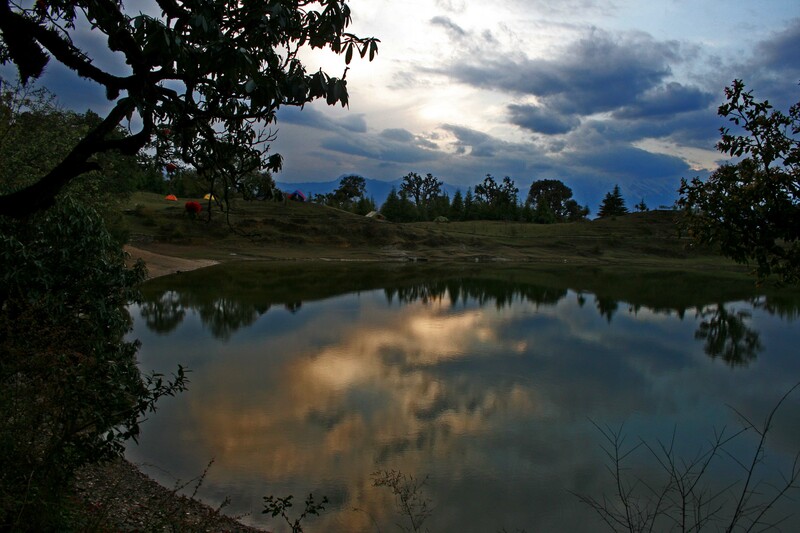 Deoriya Taal – looking at the camps in the distance. The tiny yellow one on the extreme left was mine! By this time Prashant and I had bonded even more and we indulged ourselves in some random tomfoolery. 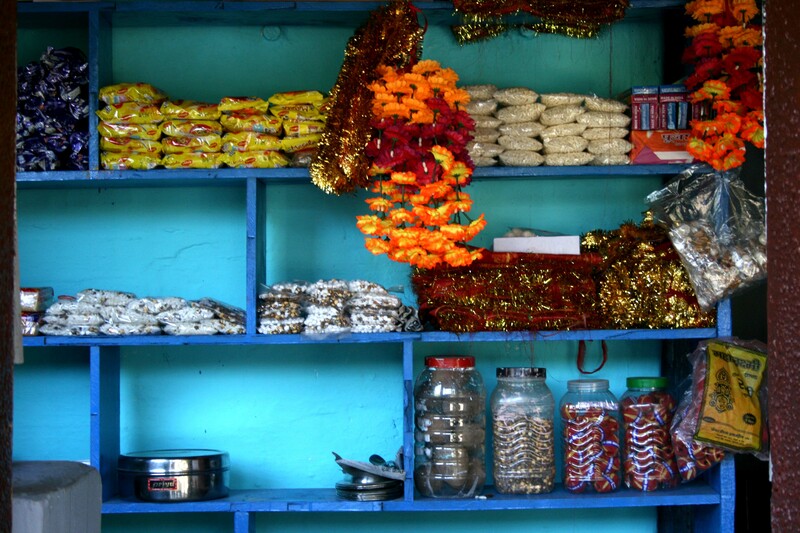 But the tomfoolery was cut short by hunger pangs and we made our way back to Negi’s dhaba. 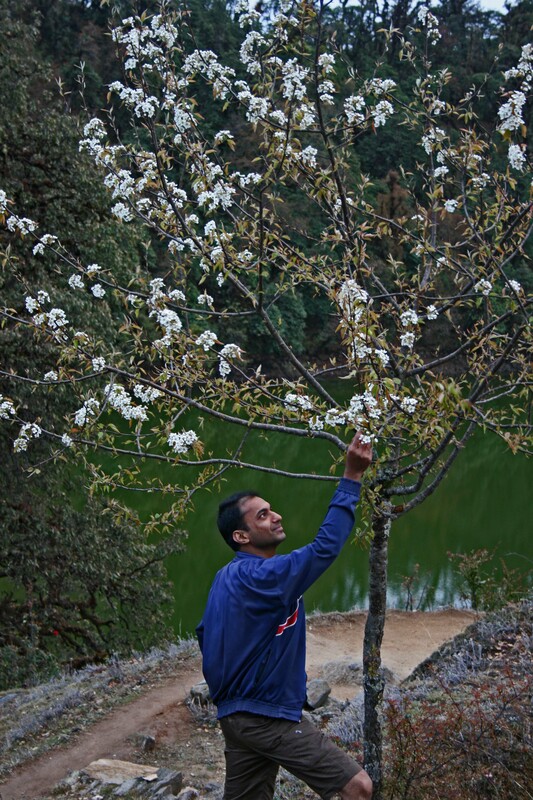 Apart from Negi, two other villagers also run their dhabas at the lake and are open throughout the year. If you contact them beforehand they will set up camp for you and arrange for food as well. If you are on a budget, you can even crash in the dhabas, but I would suggest you get your own sleeping bag. 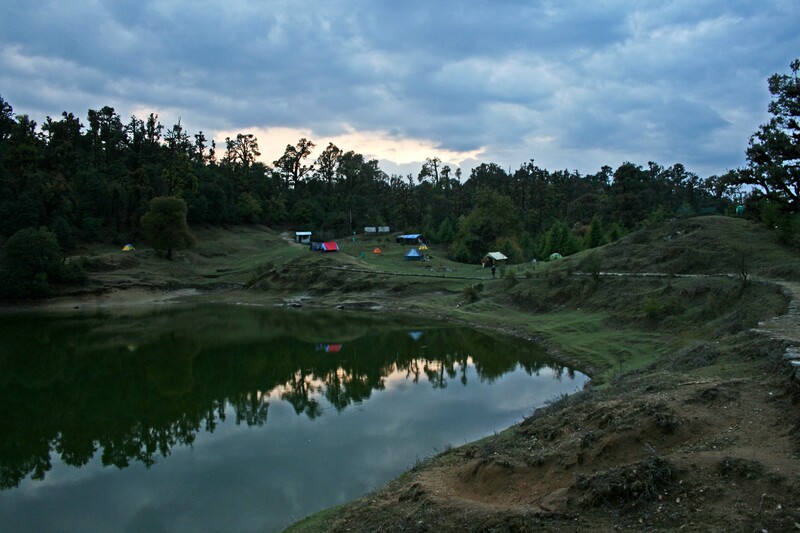 Not only had Negi found the most beautiful spot for us to camp, he had also arranged for some alcohol, all the way from Ukhimath. Now that the sun was down, the temperature started plummeting and the alcohol was much welcome. So a fire was lit, drinks were made and for hours afterwards, stories were exchanged. As we were lifting our spirits, so to speak, the sky cleared and the glorious full moon appeared. 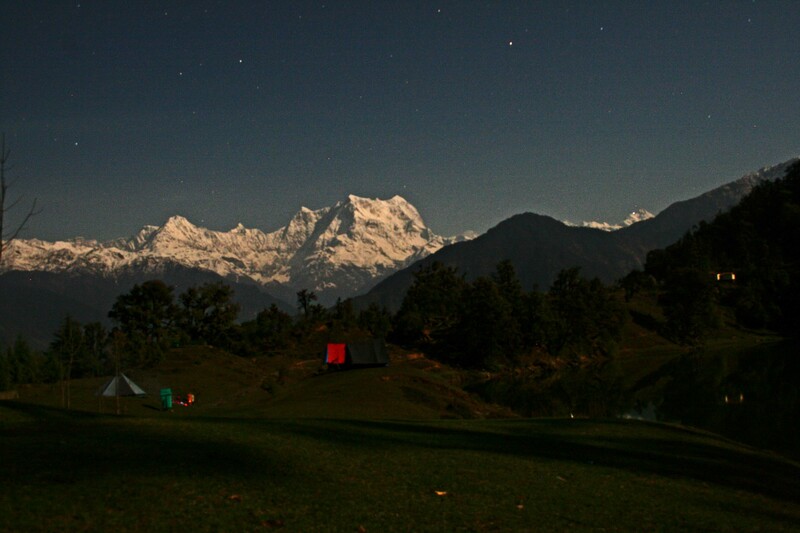 With every passing minute it was getting brighter and soon we saw what we had read about so many times on the blogs of travellers who had visited here – the spectacular 300 degree view of the Chaukhambha Massif with Nilkantha, Bandarpunch, Kedar range, Yellow Tooth and Kalanag. 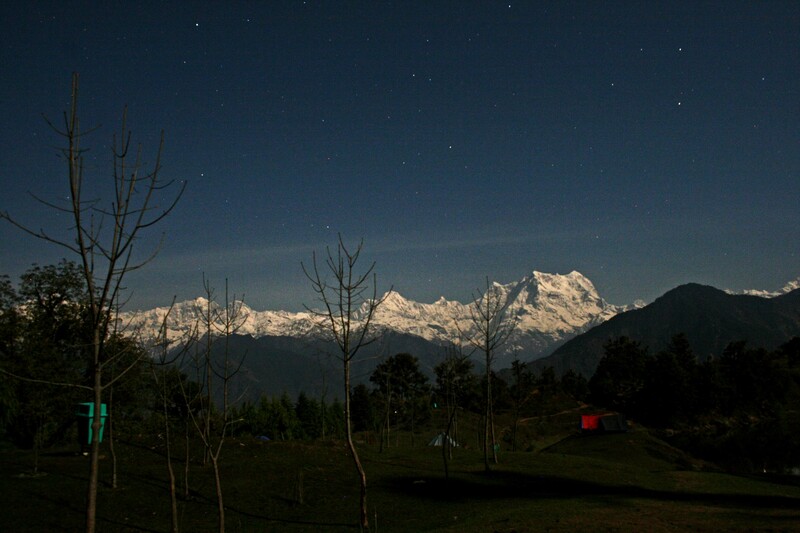 By 9pm, the moonlight was bright enough to cast sharp shadows and one could even see Nanda Devi in the distance. We moved back to the dhaba for some dinner and here Prashant decided that he was too full (drunk, really) to go back to the tent and promptly slid in a sleeping bag and fell asleep. Like I said before, the camera I was carrying is unfamiliar and unlike Nikons, the interface of Canons is always more complicated – a stumbling block for a tech Neanderthal like yours truly. So after wrestling with the settings for about half an hour, I managed to set the aperture and shutter speed to the numbers I was looking for and went in search for a tripod, or something that could act like one. A plastic chair was at hand and for the moment, it would have to do. By midnight, I was pretty much the only person on the campsite that was up and about. After all, how can you possibly fall asleep when there is so much beauty around you? The heady mix of unadulterated nature and adulterated alcohol did a number in my head and I sat watching the moon-shadows change place for hours. After all, you never know when you will be back here again. Sometimes, quite surprisingly, sleep becomes your worst enemy. P.S: I continue this questionable adventure of mine in the next post. Watch out for more snowy peaks, bad hair and breached whales! Will be back within a week. Promise! Awesome travelogue. Beautiful narration and lovely snaps. Love reading your long posts. waiting for more..